Sound systems are not linked between room, due for refurbishment 2016/17. Note Lectern on a raised platform. As such, we've kept them simple to account for any variations between rooms. For help on specifics, contact AV Support - details are at the bottom of the page. Button or touch controls for the audio/visual and projection equipment in the room. Control systems are designed to be left powered up, please leave them powered up so they can be used to turn the equipment on/off. Please switch off projectors when when not in use or the repeater screens might not work. Find out more about Aston University’s energy awareness on the website. Did you know that the lamps are not only expensive, but contain hazardous Mercury? We recommend that you login to the PC (or laptop) before turning the projector on. To switch the projector on, press the On/Off button once, the projector will beep once. It will flash to indicate it is warming up, and will prevent you from selecting other buttons until the projector is ready. At the end of your session, press the On/Off button to switch the projector off, with two beeps. Data 1 and Data 2 buttons select the MainPC and Visualiser/Laptop connection respectively. We recommend that the projector is switched on after you login to the PC. Drag/copy presentation documents from your USB stick onto the desktop. Any change/s and added files are auto-deleted on Restart. Choose VLC Media Player for DVD playback with sound. From 2017/18 the ‘pool room’ teaching PC is now Windows10 and includes Office Professional 2016 including PowerPoint, Excel, and Word. The Digital Services website has the full list of installed software, and has now moved to AstonApps Cloudpaging portal for managed software. Panopto recorder and a selection of web browsers/important teaching links are moving to AstonApps. Shared/network drives are dependant on your Aston login. If your login or the network fails .\teach username & teach password will allow you to present locally (e.g. USB drive), but without any network or internet access. Most rooms with Lenovo PCs installed will allow change to ‘Extended desktop’ for Powerpoint notes view [Windows+P]. This will remove any changes you have made, any work you have open will be lost, and any files on the desktop will be deleted. Unfinished Panopto uploads will also be suspended until Panopto is re-connected in that room. Bear this in mind if, for example, you are running an event and want to get the PC set up early or you are breaking for lunch. The computer is set up to record to Aston Replay and upload to Blackboard. There is option in Panopto Settings: Basic: ‘Highlight mouse cursor…‘ to make the pointer more prominent for recordings, and please check the mic levels are OK before starting to RECORD. There are usually 4 spare USBs on the main PC monitor. We recommend that the projector is switched ON after you login to the PC. If you don’t need the computer to be displayed on the screen, you can use it without the projector on. Computer audio requires the projector to be ON, and all control panel, computer and application volumes should be up (not muted). To use your laptop, you will need to connect the flying VGA cable* from the visualiser, turn the Visualiser ON and then select the visualiser’s laptop connection. The separate laptop audio jack cable can be connected to the laptop headphone socket, and can also be used for iPod playback when laptop is selected. Note *The visualiser must also be ON to display the laptop(/visualiser) connection in some rooms with laptop VGA socket on the lectern. Some laptops and tablets require a special adapter from the laptop to the VGA connection. NB. The visualiser must be ON to display the laptop(/visualiser) connection. Perform a variety of tasks in the rooms, depending on the type of room and microphone. They can be used to feed audio to the induction loop, make sure people at the back of the room can hear the speaker clearly (voice enhancement), or be recorded in Aston Replay. NB. some new rooms have a mic [Mute] button on the touch panel, otherwise the volume is fixed. Rechargeable Lapel and Handheld Infrared (IR) microphones with charger. There is a small volume control on the Lapel belt pack, but none on handheld. There are a maximum of two channels per room, only one lapel and only one handheld to prevent interference. Note May also be noisy/not transmit if black transmit window is obscured, two of same mics, low battery or in direct sunlight. Fully charged spares are kept by AV Support if you experience noise or interference. Please turn off microphones and replace correctly on the charger when not in use. The LEDs on the charger base will turn RED to show they are charging, and GREEN when fully charged. 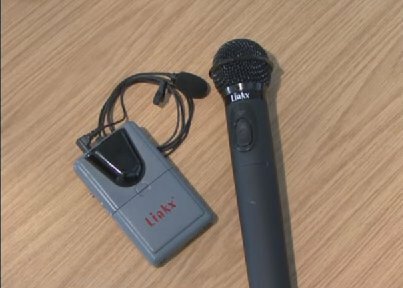 Uses a clip on or handheld microphone to ensure equal distribution of the presenter’s voice across the whole space, and freedom to interact with the audience while recording to Replay. The presenter should not be aware of any amplification at the front of the room, unlike a traditional PA system. Note Microphone audio is separate from Computer audio, and usually fixed level. A document camera that can display and zoom in on papers, books, and other 3D objects. There is usually a separate source selection button to display on the room screen/s. 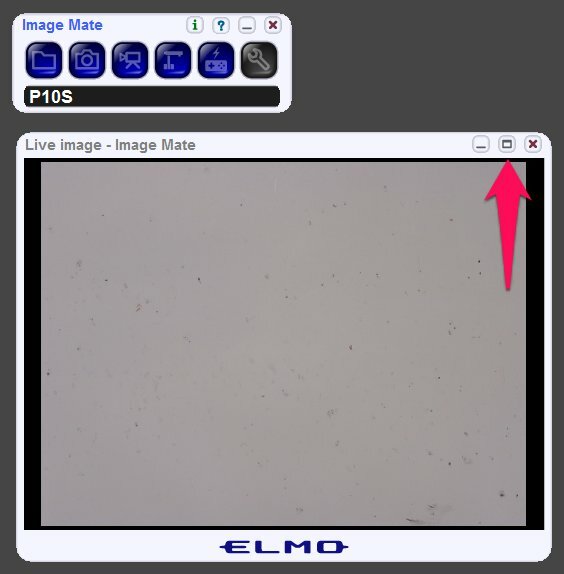 A desktop application called ImageMate[IM] allows Elmo images to be recorded in Panopto. The newer Wolfvision visualisers can be selected as separate video recording device in Panopto. Slide switch to turn ON/(OFF) and adjust lamp for best image. Zoom control(blue) and Camera/SDcard/LAPTOP selection button at the front (unless there is a separate Laptop selection button on the control panel). 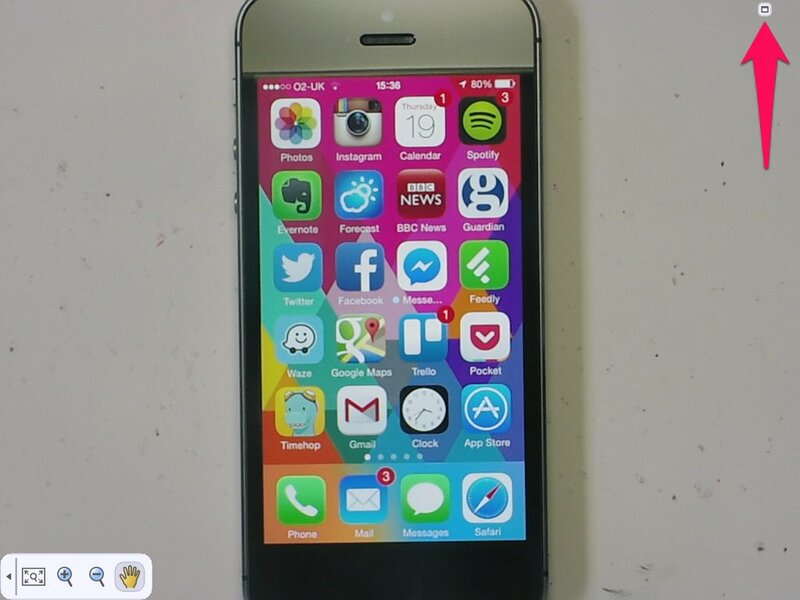 Click the maximise button – this will show the camera full screen on the computer meaning the Panopto recorder can capture it. When you’ve finished using the visualiser, you can exit the full screen view by clicking on the button in the top right of the screen. An Induction loop or Infrared (IR) based hearing system.